Perfect for that morning coffee. 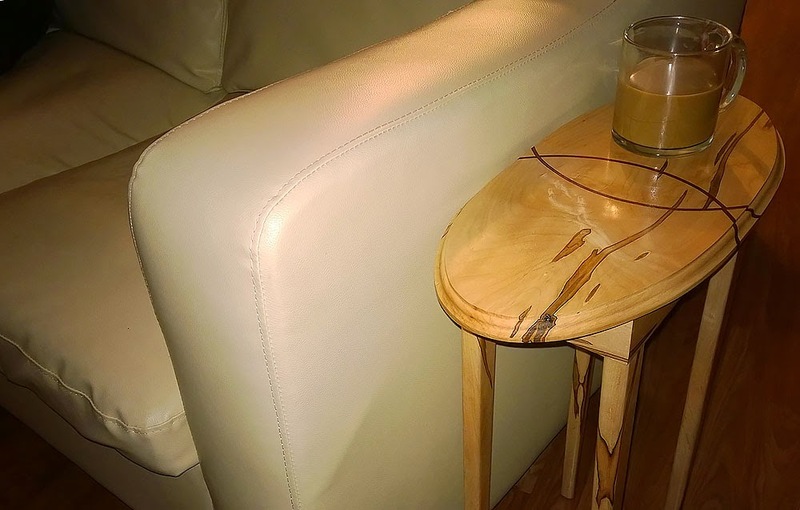 This table uses an oval shaped top, mitered box, and tapered legs. All made from a single board of ambrosia maple. It also has inlay of padauk and walnut in the top, and is finished with Formby's Tung Oil Finish. After years of moving around and not having a proper workshop (or even a "shoparage"), I'm finally in a place I can work. Yeah, it's a one car garage. Yeah, I have to share with the washer/dryer which for some stupid reason is out by the garage door, so I have to keep the shop floor clear for laundry duty. And yeah, it's a condo/townhome, not a true house, with crappy HOA rules and everything. So to celebrate, I decided to tackle a small side table. Sitting on the couch wasn't very comfortable since there was no place to rest a drink. A large heavy table wouldn't fit there, as it would block a walkway. So it had to be narrow. 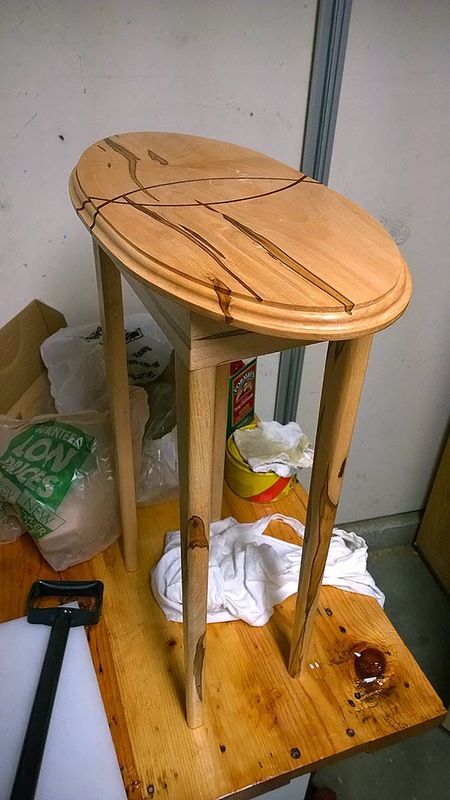 I've never done anything with tapered legs before, but thought this would be an opportunity to do something a little more delicate than I'm used to. I'll start off by saying that I didn't draw this out first, like I should have. This was all in my head, and done over 2 months. So I made lots of mistakes that wouldn't have happened if I'd planned properly. First I drew two curves on the board for the top to create the inlays. I cut these out on the band saw, one at a time. 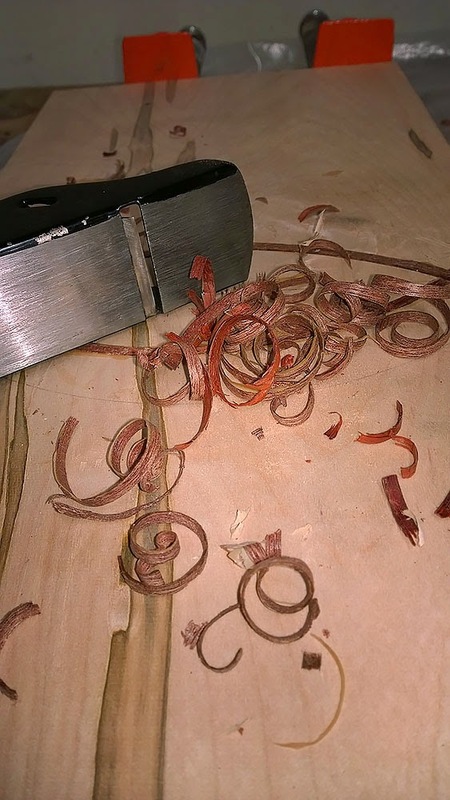 I did the padauk strip first, then after the glue dried, I did the walnut. I didn't create a kerf the same width as the wood I was inlaying. This caused an offset when gluing them together. You can see where the two curves meet that they don't quite align. The process was sound, and my worst fears of the glue failing and the padauk ripping the board a part never materialized. The mallet was to give the pieces taps to keep them planar while tightening the clamps. They kept wanting to shift. Previous glue ups taught me to expect that. I used my cheap little Harbor Freight block plane (they call it a mini plane) to clean up the inlays. 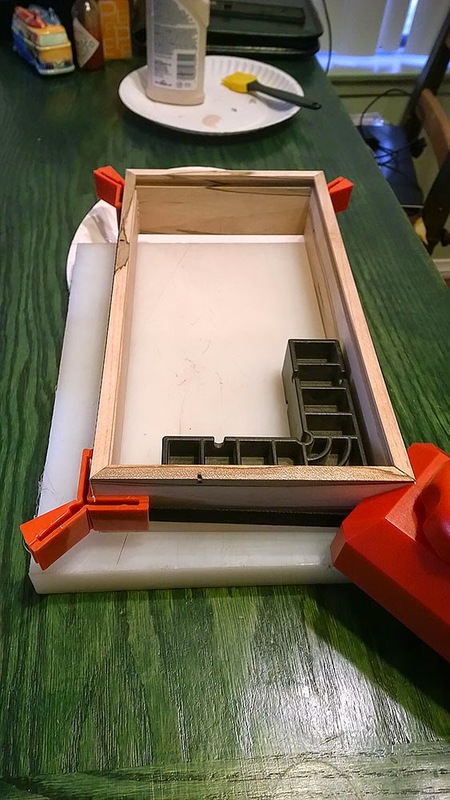 While that was drying, I made the box to frame up the legs and top. In my head I had wanted to make the top flip up to expose a little cubby to store the TV remotes. I realized after slotting the box sides to hold a bottom that the top would weigh as much as the rest of the table. That wouldn't exactly make for a stable situation when lifting the top to access the cubby. So I gave up on that idea, but the slots remained. I love this little cheapo strap clamp. I've used it so many times over the years, I can't imagine doing without. The white plastic rectangle is UHMW (Ultra High Molecular Weight) plastic. 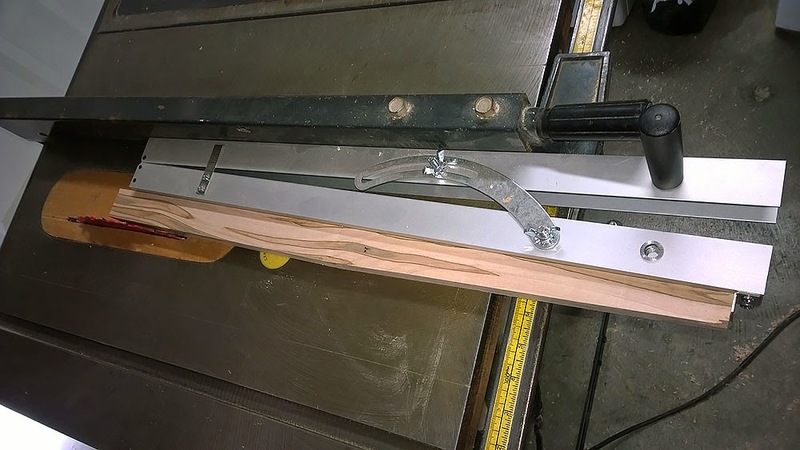 There isn't much that sticks to UHMW plastic, so it makes a great glue up surface. The company I work for uses it in their manufacturing process, so I have a nearly unlimited supply of scraps. I used a taper jig from Woodcraft on the table saw to cut the leg tapers. I'm not very happy with this thing. It's the first time I used it and probably the last. It honestly scared the crap out of me. It's too flimsy to be stable. Pushing on the handle at the bottom allowed the forward end to tip up if it wanted. And the wood wasn't held by anything except the toe at the bottom. So it was a comedy of me holding the handle of the jig, a pushstick to keep the wood from flipping up at me, all while avoiding the sharp spinning thing in the middle. And to top it off, the toe is steel, and far too large. Can't make the tapered end less than 1/2" wide. And even at that size I was freaking out that my hand would slip and bump the steel toe into my blade, damaging both and possibly injuring me. This isn't unique to the Woodcraft version of this jig. Many vendors sell the same jig, just in a different color or with a different badge. I think a better solution is to make our own jigs. 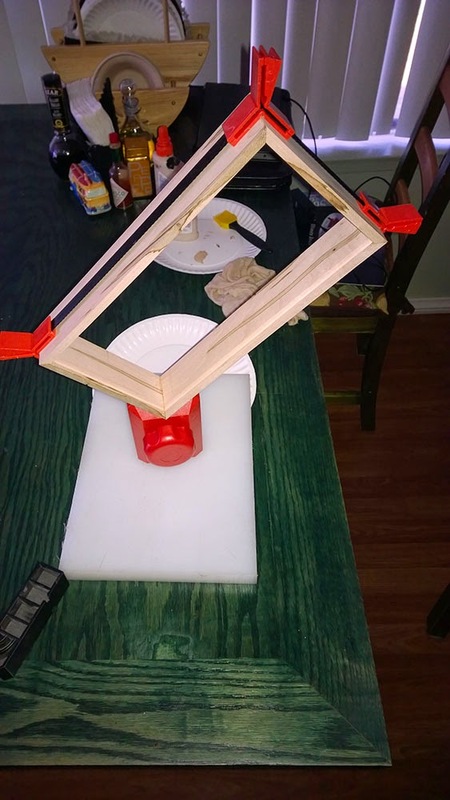 I can use pine and some hinges and get better results. I used Formby's Tung Oil finish for the table when it was all done. I liked the color it gave the wood. Not sure about durability, but it's a repairable finish (according to the manufacturer), so not a big deal. If it becomes an issue, I can apply lacquer later. But 6 coats of the tung finish, followed by lots of wax, should be good. You can't see it in the photos, and it's pretty tough to see in person too. But I mounted one leg backwards. The taper is outside, not inside. The top is too small for the rectangular box underneath. I should have made it far shallower, or made it an oval like the top. 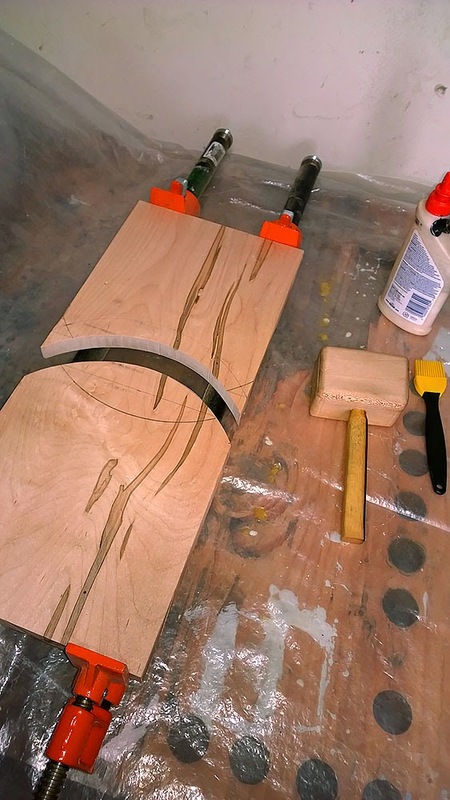 I didn't take any photos of cutting the top into an oval, but I did the two tacks and a string method to draw the oval on the board, and the band saw to cut it out. 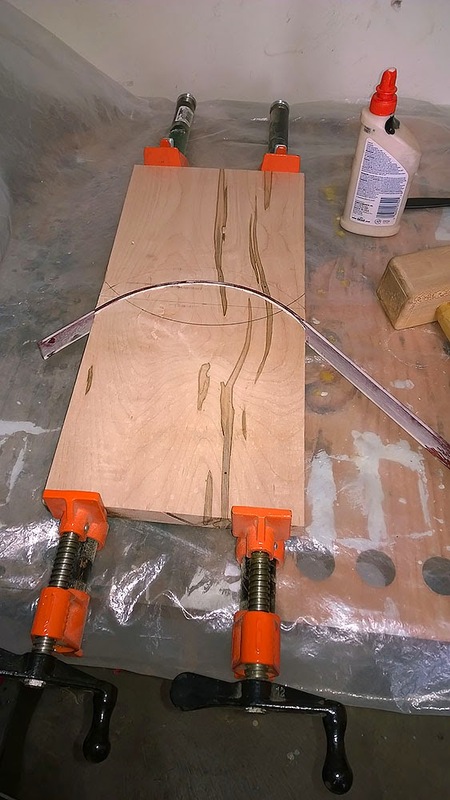 I think a proper oval jig with my router would be better for next time. Edge treatment was a common roman ogee bit on my router table. I'm overall happy with the end result, and nobody will notice my screw-ups but me. But I've learned that I can't work out of my head. I need to lay it out on paper so I can catch flaws BEFORE I start building.